Since the start of the war in Eastern Ukraine in 2014, 10,000 Ukrainians have been killed, 8,000 soldiers wounded, and millions have been displaced. Stressful combat causes many soldiers to suffer from post- traumatic stress disorder (PTSD) leaving them unable to return to their previous lives. Realizing that veterans have no opportunity to find decent jobs, "C14" ("SICH") was formed to help soldiers returning from antiterrorist operations (ATO) who need psychological, physical or occupational rehabilitation. After successfully completing their rehabilitation, the veterans are offered a three-month course in information technology. The program promises participants job placement upon completion. The first course was funded by UUARC. We hope that this rehabilitation program will be successful and are look- ing forward to our continuing cooperation with “C14”. Children from Donetsk Oblast prepared for the Holodomor Victims Day with the help of Olha Mak's "Stones under the Scythe" books. The Women's Association for the Defense of Four Freedoms for Ukraine published and paid for these books, requesting that UUARC distributed them in Ukraine. Click here to learn more about this book. When Terri Moran's two adopted children from Ukraine entered Carmel Catholic High School and were required to volunteer 40 hours per year as a service project, Terri joined her children in a very worthy cause – helping other orphans in Ukraine. Together, with their friend, Lisa Saviano, they conducted a 'Shoe Box Project' benefitting the Ternopil Regional Foundation "Orphans Future" in Ternopil, Ukraine headed by Andriy Nazarenko, himself an orphan. Terri also turned to her sisters at the Triple Delta Sorority, who have agreed to run the Shoe Box Project as their service project. Friends, neighbors, and family have all joined in! A shoe box is filled with new age-appropriate items such as clothing, school supplies, toys, sweets, items of hygiene, or whatever can make a child or young adult happy and feel like someone cares. The boxes are then sent to “Orphans Future” for distribution. This is only one example of how an individual challenged herself and raised funds for UUARC. Please keep UUARC in mind for fundraising opportunities in your community. UUARC has been a long time sponsor of Ternopil Regional Foundation "Orphans Future" in Ternopil, Ukraine. The Abington-Jefferson Health System of Abington Memorial Hospital in Abington, PA generously donated patient gowns to UUARC for hospitals in Ukraine. Due to the efforts of very dedicated volunteers, 118 boxes of 6,977 neatly packed patient gowns were sent in a container to Ukraine in September 2017. The rest will be sent to hospitals in Ukraine with the upcoming third shipment of the year. UUARC has sent $10,000.00 in Humanitarian Aid to Texas, to help Ukrainian Americans in dire need because of the destruction caused by Hurricane Harvey. Please join us and donate funds to assist the residents in their desperate needs as a result of this natural disaster. Or you may send your checks to UUARC, marked ‘Harvey’, and we will forward the funds to them. Весна дає нагоду почистити, упорядкувати беладдя та зорганізуватися. Коли я почала цю роботу, побачила що маю додаткове інвалідне крісло, ходунки („вокер”) та багато інших речей які вже не потребувала. Відразу це нагадало мені зображення поранених українських вояків, котрим війна змінила життя навіки. Я подумала про всіх тих родин, котрі втратили все через російську інвазію східньої України. Я сконтактувалася із ЗУАДК – рганізацієпю яка реґулярно висилає гуманітарну допомогу Україні – і запитала чи вони приймуть ці речі як даток. Відповідь була ентузіястична „так” — так довго як було б досить речей щоб варто було вислати „вен” до Йонкерсу. перекладних стільців, 12 ходунків, стільці на душ, портативні туалети, палиці, милиці, поруччя для ліжка, медичні, шкільні й канцелярійні приладдя, а також багато пачок і торбів одежі, постелі, коців, і т. п.
Три чоловіки від ЗУАДК-у заладували вантажне авто по вінець датками, які будуть вислані до багатьох потребуючих місцевостей України. Вони були дуже вдячі й зазначили, що існує дійсна потреба на цього роду гуманітарну допомогу. Ця подія була описана у статті Ерні Ґарсія на інтернетній сторінці газети „Джорнал Нюз” 27 квітня цього року; він перевів інтерв’ю з Оксаною Кулинич, організаторкою цієї акції, і Мотрею Бойко-Вотерс від ЗУАДК-у. Статтю і відео можна побачити на веб-сторінці: http://lohud.us/2sBx0F4. Щира подяка за їхні щедрі датки родинам: Бундзяк, Коген, Деметроповлос, Гулінський, Кащак, Кіцюк, Коваль, Кулинич, Прибила, Руденський-Сілвер, Смит, Сорока-Волф, Сирко-Еспосіто, Шкафаровський Петро, і Шкафаровський Павло. Оксана Кіцюк-Кулинич є довголітньою активісткою української громади. За дальшими інформаціями, можна телефонувати до неї на ч. 914-965- 6467 або писати на електронну адресу okul17@aol.com. Springtime is a chance to clean, declutter and organize. After starting this task, I realized that I had an extra wheelchair, walker as well as many other items I no longer needed. It immediately brought to mind the images of the wounded Ukrainian soldiers whose lives were forever changed by the war. I thought of the many families who had lost everything with the Russian invasion of eastern Ukraine. I contacted UUARC in Philadelphia, an organization that regularly ships humanitarian aid to Ukraine, and asked if they would accept these items as donations. They replied with an enthusiastic “Yes”, as long as there were enough things to make it worth their while to send a van to Yonkers, New York. A request for donations was put into St. Michael’s Ukrainian Catholic Church bulletin, the SUMA Federal Credit Union as well as the Ukrainian American Youth Organization facebook page and emails sent to individuals. The Yonkers community and surrounding areas responded with overwhelming support. It was very gratifying to hear from the many individuals who donated and felt that they were giving to this worthy cause. Among the many items that were collected were a hospital bed, ten wheelchairs and transfer chairs, twelve walkers, shower chairs, portable toilets, canes, crutches, bed rails, medical, school and office supplies as well as many boxes and bags of clothing, linens, blankets etc. A truck, loaded by three men from UUARC, was filled to capacity with the donations which will be shipped to the many needy areas in Ukraine. They were so grateful and indicated that there is a real need for this type of humanitarian assistance. The event was reported in the online edition of the Journal News on April 27, 2017 by Ernie Garcia who interviewed Oksana Kulynych, the organizer of the donation drive and Motrja Bojko-Watters from UUARC. Please go here to view the full story and view the video. Thank you to the following families for their generous donations: Bundziak, Cohen, Demetropoulos, Hulinsky, Kaszczak, Kiciuk, Kowal, Kulynych, Mikula, Prybyla, Rudensky-Silver, Smith, Soroka-Wolf, Syrko-Esposito, Szkafarowsky Peter, Szkafarowsky Pawlo. FOOD DRIVE FOR UKRAINE - In January 2015, 1.5 – 2 tons of non-perishable food items were collected and shipped to Kyiv through UUARC, and distributed to those living in Eastern Ukraine. The Collection sites in the Philadelphia area included the Ukrainian Educational & Cultural Center and The Ukrainian League of Philadelphia. 12 січня Філією ЗУАДК-у в Украіні було передано апарат транскраніальної мікрополяризаціі для Геріатричного Нейрореабілітаційного Центру ДУ при Інституті герантологіі ім. Д.Ф. Чеботарьова Національної Академії Медичних Наук Украіни. Цей апарат було закуплено в США ЗУАДК-ом. Кошти були зібрані українською громадою Америки, а саме: танцювальний ансамбль ‘Громовиця’ з парафіянами УКЦ св. 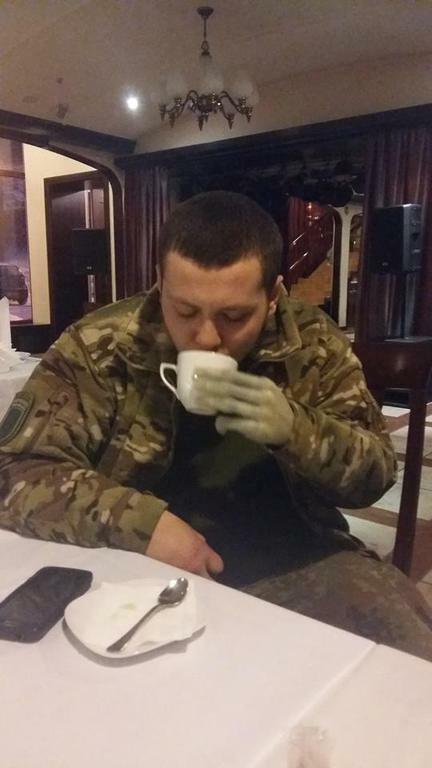 Володимира та Ольги в Чікаґо, ($4,000), Зоріана Молтан та парафіяни УКЦ Святого Миколая у Вотервліет, Ню Йорк,($2,000). До сьогодні в Украіні таких апаратів було два. Згідно останніх даних транскраніальна мікрополяризація має високу ефективність в реабілітації пацієнтів, які перенесли черепно-мозгову травму та інсульт. Такі апарати є надзвичайно необхідні для лікування воїнів з АТО. 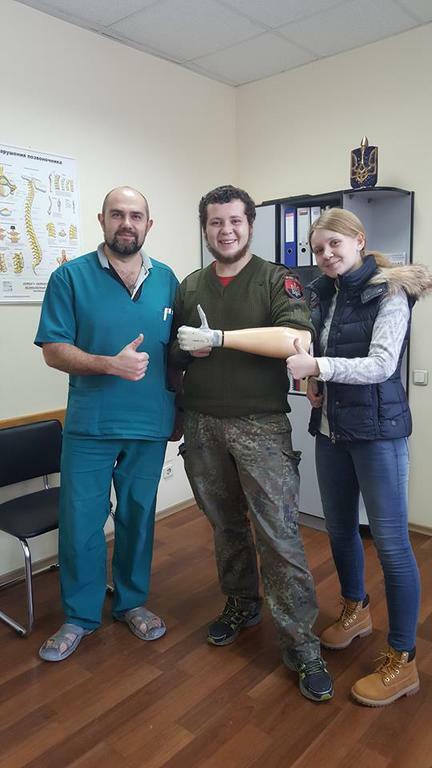 HELP FOR A YOUNG UKAINIAN HERO - While opening a donated package marked “medical” at the Kyiv Maidan, 20-year-old Roman Dzivinskyi lost his left arm at the elbow and the fingers on his right hand when the package exploded. Additionally, the shrapnel from the explosion caused injuries to his face, arms, chest, eyes and lungs. It was only by the Grace of God that he survived. Roman was treated in Lviv and Poland and finally arrived in Philadelphia for more medical treatment with a hope of acquiring a bio-mechanical prosthetic hand and arm. Unfortunately, before Roman’s treatment was completed, his visa expired and he had to return to Ukraine. Through many appeals for help, Touch Bionics, a manufacturer of prostheses in the United Kingdom agreed to help Roman. On December 29, 2015, Roman recieved his bio-mechanical hand! Thanks to all of our donors, this young man is resuming a more normal life. The actual attachment took place in Lviv in a specialized clinic. The total cost of this undertaking, including the prosthesis, all assessments, therapy, measurements, and fittings was $60,000. "Greetings to everyone, friends! I want to thank everyone for the present I received with the New Year. This is the best that could be. I received a new prosthesis which I have already used to write, eat, do different work at home and even drive an automobile! I am very deeply grateful to all who contributed to my treatment and prosthetic!!! Thank you for the prosthetic, which was paid for by the Ukrainian-American community of the United States through the efforts of the "United Ukrainian American Relief Committee" (UUARC or ZUADK) and thank you to the official representative of Тouch Bionics Ukraine, LLC "Stalmed." "Всім вітання друзі! Я дуже хочу всім подякувати за подарок на Новий Рік. Це саме найкраще що могло бути,мені поставили новий протез з яким я вже пробував писати,їсти,робити різні роботи в дома і навіть їздити на машині. Я дуже сильно вдячний всім хто долучився до мого лікування і протезування!!! Дякую за протезування, що оплатили Українсько-Американська громада США за старанням «Злученого Українського Американського Допомогового Комітету» (ЗУАДК) та офіційного представника Touch Bionics в Україні ТОВ Стальмед. Roman Dzivinskyi expresses his gratitude through thank you letters for the tremendous effort UUARC contributed to his treatment through its many gracious contributors. WOUNDED SOLDIERS RECEIVE AID - Bishop Basil Tuchapets, OSBM presented financial help to wounded soldiers at the ATO military hospital in Kharkiv that was collected by Christ the King Ukrainian Catholic Church located just outside of Boston, MA. FARM AID PROGRAM - UUARC feels it is imperative to revitalize the agrarian benefits of Ukraine, formerly known as the "breadbasket of Europe", using the existing natural resources and the growing entrepreneurial spirit. Based on this premise, we have researched the areas in Western Ukraine where there is very little in the way of industry, and the land lies unused. We have carefully selected three villages where there is sufficient land and work force available, where we have established trial farm co-operatives. ﻿ This program ultimately addresses two issues vital to the Ukrainian population: the issue of feeding the people and the issue of fiscal independence. SHOES FOR UKRAINE- Thanks to the generosity of Mrs. Halyna Utrysko, UUARC was provided with a golden opportunity to obtain 8,000 pairs of adult, teen, children’s, and infant's shoes for shipment to Ukraine. The shoes were stored in a warehouse in the Wisonoming section of Philadelphia. In three days, several dedicated volunteers took the time to unpack, sort, count, itemize and repack 8,000 pairs of shoes into sealed, marked cartons for shipment to Ukraine. The volunteers began their arduous task on Saturday March 1, 2008, and in a relatively short time the UUARC crew did the impossible. By Wednesday evening March 5, 2008 deadline, 190 cartons of shoes were packed, individually labeled, counted and otherwise signed, sealed, transported and stored at UUARC headquarters on Cottman. The UUARC volunteers who did the impossible were: Ihor Bilynsky, Darka Fedak, Roman Iwaskiw, Halyna Karpchuk, Oleh Kondrat, Stefa Kozak, Marijka Kozak, Melania Kozak, Dmytro Luciw, Yury Nakonechnyj, Larissa Nysch, Luba Siletsky, Sofiya Sydoryak, Alanna Watters, Alexa Watters, Andrea Watters, David Watters, Motrja Watters, Andrew Zalucky. VOCATIONAL TRAINING PROGRAM - For disadvantaged children was established in 1993 in 11 youth homes in Western Ukraine with USAID fundign and jointly administered by World Learning, Inc. and UUARC. It is now a self-sustaining program. EYEGLASS PROGRAM - Started in 1997 in 13 eastern regions of Ukraine. Over 10,000 orphans were examined and received new perscription eye glasses they otherwise could not afford. CHERNOBYL PROJECT - In existence since 1990. This project is a resettlement effort for individuals living in the Chernobyl area. In November 1998, one of the worst floods of the century devastated the Transcarpathian region of Ukraine and Romania. UUARC, as a charitable organization, helped the affected families and individuals who lost everything in this natural disaster. UUARC collected, through the generosity of the Ukrainian-American community, over 300 parcels and $70,000.00 in financial aid. 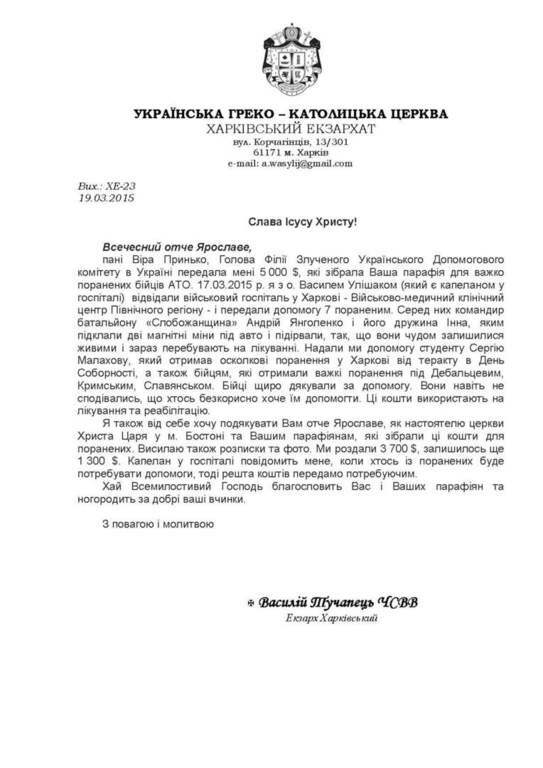 The parcels were sent via container - $20,000 were sent to the Ukrainian community in Romania, $20,000 of the relief funding was transferred to Transcarpathia by the Director of UUARC’s Lviv office, Dr. A. Dyda, and the balance ($30,000) was delivered to Uzhorod by the Executive Director of UUARC, Mr. Stefan Hawrysz. In August 2007, Nova Odessa a city in Eastern Ukraine, was totally devastated by heavy rains and floods. Humanitarian Aid parcels were prepared and shipped by UUARC. This project also lead to the opening of a soup kitchen. In July 2008, the western oblasts in Ukraine (Ivano-Frankivsk, Lvivska, Chernivetska, and Vynnytska) were hit by calamitous floods destroying many homes and villages. Immediately the UUARC began a campaign to collect funds for the devastated victims. Overall, the UUARC collected $116,500, which the UUARC office in Lviv distributed to individual flood victims. Contributions of $10,000 were made by: Bayonne Ukrainian Home Foundation, Self-reliance New York FCU, and SUMA Federal Credit Union. H1N1 FLU EPIDEMIC - In November 2009 Emergency Aid in the form of 1,000,000 masks and 12,488 bottles of hand sanitizer were flown to Ukraine for distribution in the Lviv, Ivano-Frankivsk, and Ternopil oblasts. Total cost of aid: $75,000.00. KRASNODON MINE ACCIDENT - Unfortunately, accidents in the coalmines of eastern Ukraine are not a rare occurrence. Each incident is both a national and a personal tragedy, leaving behind devastated widows, bereft parents, and hundreds of orphaned children. The 1999 explosion in Krasnodon, near Luhansk, was one of the worst in mining history, with 80 dead and seven injured. UUARC responded immediately, by sending $16,700 ($200 per family of the deceased, and $100 per family of injured miners), before even appealing to the community for donations. The director of the UUARC’s Kyiv office, Vira Prynko, personally delivered this aid to the families of the victims. Not even the government of Ukraine, which promised aid to the families, had given them anything by the time Ms. Prynko visited them. Thanks from Krasnodon poured into our offices, and again, the Ukrainian American community responded from the heart. COAL MINING ACCIDENTS - Unfortunately, accidents in the coal mines of Eastern Ukraine are not a rare occurrence, but each incident is both a national and a personal tragedy, leaving behind devastated widows, bereft parents, and, most tragically, hundreds of orphaned children. In November 2000, the mine explosion in Krasnodon, near Luhansk, was one of the worst in mining history, with 80 dead and seven injured. UUARC responded immediately, by sending $16,700 to be distributed ($200 per family of the deceased, and $100 per injured one), before even appealing to the community for donations. The money and the first aid was personally delivered to the families of the victims, by the Director of UUARC’s Kyiv office, Ms. Vira Prinko. Even the government of Ukraine, which promised aid to the families, had not given them anything by the time Ms. Prinko visited them. Those assisted in Krasnodon have expressed their sincere gratitude.